When it comes to major American pop stars fetching up in our lovely city, Londonist sometimes thinks that the Eighties never ended. Following Madonna's permanent move here, and Prince's celebrated 21 shows last year, the third in the triumvirate of pop megastars from the Decade That Style Forgot is to join them - Michael Jackson is reportedly coming to town, and he'll be on a nice little earner if he does. Like Prince, Jackson is eying up the O2 in southeast London as a venue. Not to be outdone by His Purpleness, however, Jackson is set to play a month-long residency, with reports suggesting that the star will trouser a not-too-shabby half a million pounds each night. We reckon that's about fifty quid per "ow!" or "he-hee-hee". To say that Jackson has endured troubling times since his prime is putting it mildly. Aside from the brief, baffling marriages, the children of suspect lineage, the plastic surgery and the balcony baby-dangling in Berlin, there was the showbiz trial of the decade which saw the singer eventually walk free from child molestation charges. 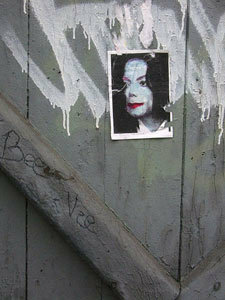 Perhaps understandably, Jacko's public performances in recent years have been rare and erratic. Hopefully fans shelling out for his new London dates will get a more impressive showing than his bizarre appearance at the World Music Awards in 2006, where he disappointed a crowd expecting Thriller by instead belting out a half-chorus of We Are The World before mugging for the camera and disappearing amidst a cavalcade of boos. It's easy to be cynical about Jackson's latest attempt to, in the words of his publicist, "be remembered for his music, not his problems", but we're genuinely intrigued and maybe even excited about what kind of show we'll get. At his peak, Jackson was one of the world's best pop performers and had a reputation for regularly pulling astonishing gigs out of the bag. At 45, his feet may not be so nimble, but if the voice has endured then this could be one of the standout moments in London's rich music history. Or, conversely, it could be an absolute stonking grandmother of a disaster. Either way, Londonist is going to be spending the rest of the day perfecting its moonwalk and crotch-grab while hunting down a single white glove. Cha'-mon!